One of the Best Parallel Actions which could have taken place between Electric and Diesel Loco hauled trains !! Seen here is the Magic of Twin Single Lines (Dual Bi-directional Lines) which is the main reason for this kind of Parallel Action Events to Occur. Twin Single Lines of Dual Bi-Directional Lines are those Doubled lines in which the trains are allowed to go in both the directions unlike the usual Double Lines, where the direction of the train is fixed. 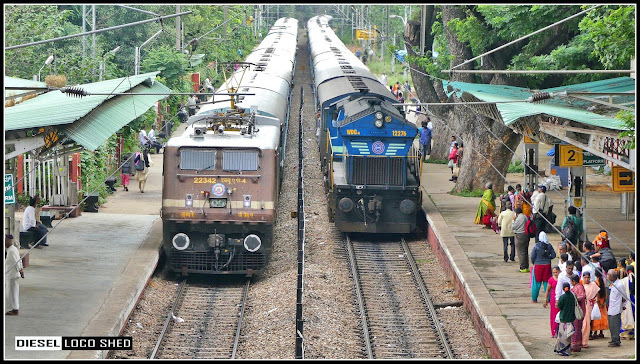 The Parallel Action is between WAP 4 Powered Hindupur KSR Bengaluru Passenger (On A - line) and WDG 4 powered Arasikere KSR Bengaluru Passenger (On B - Line). The MAGIC of Twin Single Lines ! !